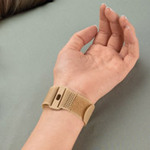 …supports either the right or left thumb. * Antimicrobial micro-terry inner layer. 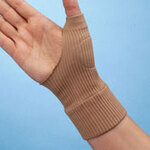 * Thumb brace includes removable stay for custom support. 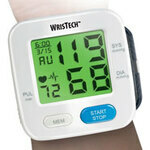 * Specify size: small/medium (fits wrists 5 1/2”–7 1/2”) or large/XL (7 1/2”–10”). 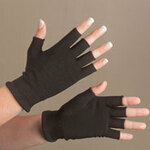 * Latex-free neoprene/nylon/polyester. * Hand wash; dry flat. Made in USA. 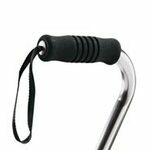 Add fashion-forward flair and foam-grip comfort to a standard cane. 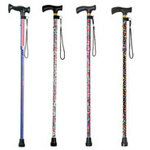 Each colorfully designed cane grip features black accents, including a wrist strap for easy use without fumbling. 4 1/4" L x 1 1/2" W. Opening is 3/4" W.
…nail remover, and large and small jar grippers with serrated metal edges to securely grab lids. 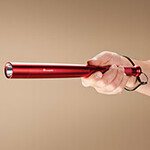 * 7 handy tools in one device ease everyday living. 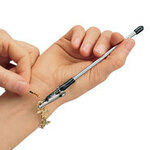 * Ideal for anyone with hand or wrist weakness. * Generous 7” x 2” x 9” size is easy to grasp. 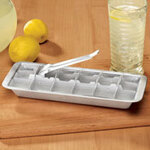 * Durable, wipe-clean plastic and stainless steel. …to 39 1/2”H with the touch of a button to promote proper posture for maximum comfort. * Other safety features include a 3/4”dia. non-skid tip and wrist strap. 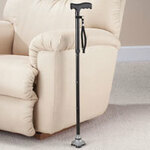 * Lightweight aluminum cane weighs less than a pound yet supports up to 250 lbs. * Choose from 2 fashionable colors: rose pattern or purple.